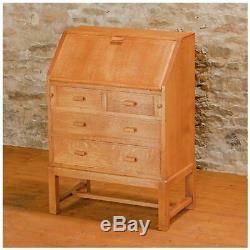 Heal and Co (Ambrose Heal) Arts & Crafts Cotswold School Oak Bureau. Style - craftsmanship - Longevity - Functionality - Value. 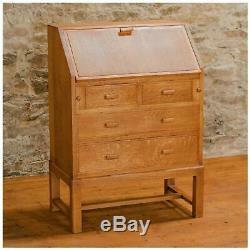 An Arts & Crafts Cotswold School 1950's oak bureau, by Heal and Co.
Made in Well figured Oak. 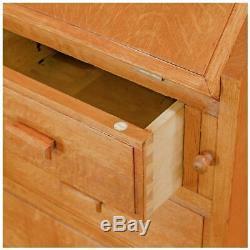 2 short over 2 long drawers (made with solid drawer carcasses joined with hand-cut lap and through dovetails). Fall front enclosing pigeon holes. 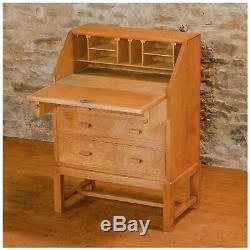 A classic design by this iconic Arts & Crafts maker. Overall height 10 cm (3 and three quarters inches). Overall width 69 cm (2 feet 3 and a quarter inches). Overall depth 41 cm (1 foot 4 and a quarter inches). Ivorine disk with'Heal's' in the centre (introduced in the 1930s). Heal and Co (Ambrose Heal): One of the first Arts and Crafts makes to bring efficient business processes to the design and production of quality furniture. Sir Ambrose Heal had the vision to work with the most skilled craftspeople of the day, creating furniture that was comfortable, beautiful reflecting the ideals of the Arts and Crafts Movement but at a more affordable price. 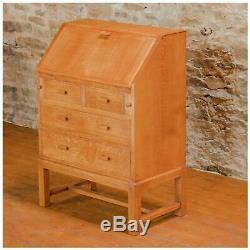 Today Heals furniture from the period 1900 to 1940 is highly prized. Oak: The most British of woods, that can produce really special results. 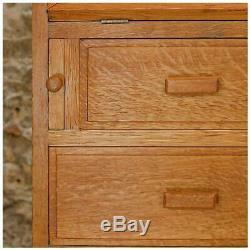 Oak has been used for hundreds of years to construct everything from sea-going vessels to fine furniture. Quarter sawn boards are very straight grained and have distinctive growth rings and medullary rays that give a very beautiful effect as well as being renowned for their superior stability and strength. 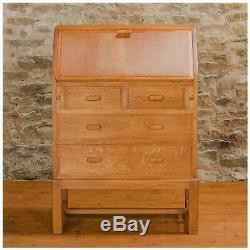 About Arts & Crafts Cotswold School Furniture. The Cotswold School was a development of the Arts and Craft Movement started largely by Ernest Gimson and the brothers Sidney and Ernest Barnsley. The furniture is instantly recognisable with its simple lines, attention to the finest of details, and use of beautiful materials. Cotswold School designs were crafted from local materials using traditional tools and techniques and with decorative details derived largely from utilitarian elements: exposed joinery, unusual panels, interesting pulls and latches crafted either from wood or from metal using traditional smithing techniques, and close attention to form as well as to wood grain and pattern. Where decorative details were added they generally took the form of traditional embellishment such as exposed joints, chamfered edges and chip carved edge details. The style was embraced and developed by other designers and craftsmen including Gordon Russell, Stanley Webb Davies in Cumbria, Sid Barnsley's son Edward, Arthur Romney Green in Hampshire, Robin Nance in St Ives and Ambrose Heal are a handful of such men out of many. The best developed their own style within the established tradition. Handicraft Antiques specialises in high quality Arts & Crafts Movement and Yorkshire School furniture from about 1900 onwards. Central to our philosophy is to sell furniture and furnishings that exhibit great design, outstanding quality of workmanship, are made with beautiful materials and are functionally useful and useable. Many of our items will be of a similar cost to a modern mass produced equivalent, yet are likely to hold their financial value, or even appreciate over time, whereas inferior mass produced new items are very likely to quickly lose value. Our stock typically reflects some of the best designers and makers of their period including, Ernest Gimson, Peter Waals, Arthur Simpson, Stanley Webb Davies, Gordon Russell, Edward Barnsley, Liberty Ambrose Heal, Betty Joel, Shapland & Petter, Bath Cabinet Makers and numerous other craftsmen from the Arts and Crafts Movement, but also selected other items by less well known makers that are just beautifully designed and made. The showroom is just 10 miles of beautiful countryside driving off Junction 38 of the M6 and you can park free immediately outside. There is of course a subjective element to describing the condition of items, so if something is not as clear as it should, be please ask for clarification. It's not normally possible or desirable to restore items to perfect as new condition, so unless otherwise stated you should expect items to have some character - small amounts of age related wear and tear, such as light scratches, tiny chips/dings, minor marks and slight colour variations. These won't detract from the overall appearance and are generally only noticeable on close inspection. 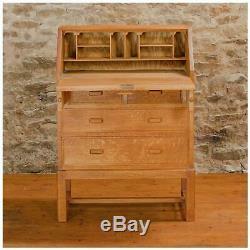 The item "Heal and Co (Ambrose Heal) Arts & Crafts Cotswold School Oak Bureau" is in sale since Friday, March 29, 2019. 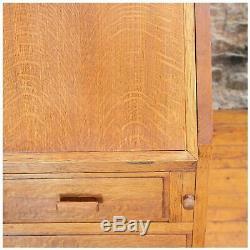 This item is in the category "Antiques\Antique Furniture\Bureaux\20th Century". The seller is "handicraft-antiques" and is located in Maulds Meaburn. This item can be shipped to United Kingdom, Germany, France.